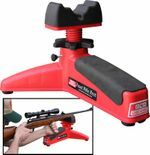 Looking for an affordable, “all-around” Front Rifle Rest? You just found it! The versatile, MTM Front Rifle Rest offers excellent, rock-solid stability at a price any shooter can afford. This three legged rest not only accommodates nearly any shape gun stock but handgun enthusiasts will find it just as accurate. Special Non-Marring, Soft Rubber Shooting Pad – supports nearly any shape stock! Gun swivel screw or muzzle loading ram rod do not have to be removed to shoot off our rest! Excellent for sighting in handguns! The rear leg has been extended, widened, raised and a black pad has been attached to make it an ideal pistol rest. Precision Dialed Adjustments – offers 3” of vertical travel for pin-point accuracy.